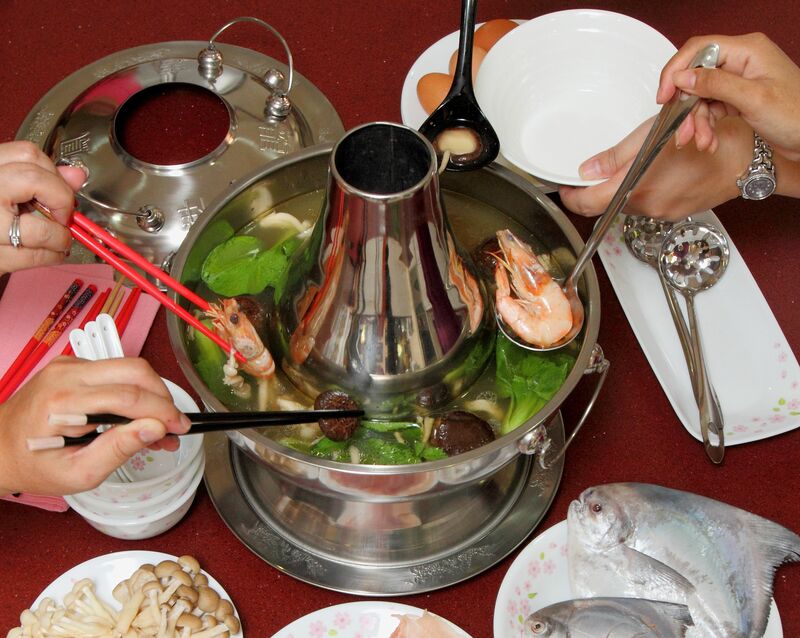 A hotpot or steamboat is customarily eaten by Northern Chinese families for Chinese New Year. The gathering of kith and kin around the circular cooking vessel reflects family unity and the warming of family ties. Most families usually prepare six or more different ingredients for their hotpot meal, to showcase the bountiful abundance of the sky, land and sea. There is symbolic meaning for each food that goes into the pot, and popular choices include prawns to represent happiness and liveliness, fish for abundance and surplus, pork for strength and wealth, greens for prosperity, mushroom for flourishing prospects, eggs for fertility and reunion, and noodles for longevity. Here’s a simple recipe to prepare Hup Kar Foh Wor this Chinese New Year. Note: Substitute any of the hotpot ingredients according to your own preference. Remember not to overcrowd the pot with too many ingredients at one go. Have extra stock available to replenish the hotpot as the meal progresses. Noodles and egg should be cooked last, to enable these ingredients to fully absorb the flavourful stock.This recipe was first published in Flavours magazine. Remove skin from chicken and chop up into 8 pieces. Boil in water for 5 minutes to remove scum. Drain off water from chicken using a colander. Bring water to boil in a stock pot. Once boiling, add in chicken pieces, Chinese ham, topshell clams, ginger and coriander leaves. Allow everything to simmer on low heat for 2 hours. Season with salt. Remove gills and entrails from fish, then trim off fins and tail ends. Rinse and pat dry with paper towel. Fillet and slice fish then place onto a plate together with fish head and tail pieces. Snip off prawn feelers and trim legs with kitchen scissors. Keep heads and shell intact. Rinse thoroughly and set aside. Arrange belly pork slices on a plate and set aside. Trim the ends off enoki and shimeiji. Remove stalks from shiitake. Arrange all fungi on a plate. Wash and rinse baby bok choy to get rid of grit. Drain off excess water. Pour piping hot stock base into hot pot. Wait for stock base to boil, add in fish head and tail together with assorted fungi. Bring stock to boil again before dunking in the rest of the desired ingredients.